Do you miss cinnamon rolls since going gluten-free? Now you don't have to! 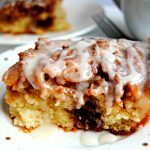 This cinnamon roll cake has both the texture and the taste of a gooey cinnamon roll. Cinnamon rolls are not just for breakfast anymore. 3 cups *gluten-free flour I like Pillsbury gluten-free. Not all gluten-free flours are created equal. You may experience different baking results depending on the gluten-free flour blend you choose. 1 1/2 teaspoons xanthan gum leave out if your flour already contains it. 1 1/2 cups milk For dairy-free I like cashew milk, almond milk or coconut milk. Spray a 9×13 glass baking pan with cooking spray. In a large bowl add the gluten-free flour, xanthan gum (leave out if your flour already has it), salt, sugar, baking powder, milk, eggs, and vanilla and mix until fully combined. Once combined stir in the melted butter. The cake batter will be very thick and sticky. Pour into the prepared 9×13 baking pan. In a large bowl, cream butter, brown sugar, gluten-free flour and cinnamon together with a mixer. Drop heaping tablespoonfuls of the butter mixture into the cake batter. Use a knife to swirl the butter mixture through the cake. Bake at 350 degrees for 35-40 minutes. Use a toothpick to check and see if the center is done. In a medium bowl, whisk the powdered sugar, milk and pure vanilla extract together. Pour over the warm cake. *Not all gluten-free flours are created equal. You may experience different baking results depending on the gluten-free flour blend you choose. I like Pillsbury gluten-free. The best way to measure gluten-free flour is the “spoon & level” method. Using a spoon, scoop the flour into the measuring cup. After you’ve spooned the flour into the measuring cup, use the back of a knife to level off the top of the measuring cup. Friends, please do not scoop the flour out of the bag with your measuring cup. For dairy-free option: I like to bake with Smart Balance butter and almond, cashew or coconut milk. Mama says "Check all of your labels!"